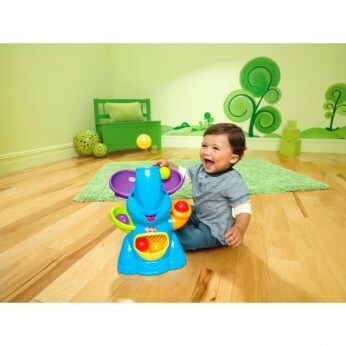 Lively air-powered, ball-poppin’ elephant features fun, upbeat music and comes complete with five balls!Elephant figure plays 10 tunes! Start the action with easy push-button activation. Includes elephant, stability base, ear attachment, 5 balls and instructions. Adult assembly required. Batteries not included. Requires 4 x D Batteries. Ages 9 months +…. This toy costs approximately £29.99 (for the latest and best prices make sure you check our retailer list for the Playskool Elefun Poppin Park above). In our review of Playskool Elefun Poppin Park we classed it as being suitable for ages 1 to 3 years, 3 years, 4 years but recommend you check the manufacturer specific advice before purchasing. Bought this for my son when he was 5 months, and he still plays with it being nearly 2, great fun and great price.